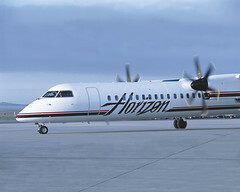 Horizon Air will provide nonstop service between Prince George, BC and Seattle beginning May 1, 2008. The once-a-day service departs Seattle at 1:20 PM and Prince George at 3:45 PM. The flight takes one hour and 45 minutes. This is the first scheduled international flight for Prince George, which is the economic and commercial hub for Central and Northern British Columbia. In addition to the Pacific Northwest, the region will have connections to such US destinations as California, Nevada, Arizona and Florida. They are served by Horizon and sister company Alaska Airlines. "Our region will enjoy access to the U.S. market for business and leisure travel," said Prince George Mayor Colin Kinsley. "Now, we look forward to familiarizing more of our U.S. neighbors with the wilderness, adventure and cultural experiences in Northern B.C., as well as the investment opportunities. There will be strong economic benefits from this new service." Prince George is 750 kilometers (471 miles) north of Vancouver and is the largest city in Northern B.C. Located at the confluence of the Fraser and Nechako rivers, it's just minutes from pristine wilderness and outdoor adventure. Pictured: Horizon's 76-seat Q400 turboprop, manufactured by Bombardier Aerospace, will operate daily service between Prince George and Seattle.